Someone needs to love too hard and laugh too loud. I have to tell others there’s still time to feel better things, less heavy things—I’m living proof. There is still hope. I’ve still got so many stories to tell. The words above are just a few of the responses shared online by people participating in our Tomorrow Needs You campaign. Today (September 10) is World Suicide Prevention Day and the beginning of National Suicide Prevention Week in the United States. With this campaign and throughout this week, our goal is to inspire as many life-saving conversations as possible, whether in-person or online, equip people with invaluable knowledge about suicide prevention, and raise $100,000 to invest directly into treatment and recovery. Organizations and people around the globe are working to do the same, and we’re hopeful that with their support and yours, we will be able to change the statistics. We ask that you visit our campaign page at the start of every day this week for a new way to get involved. The purpose of these action steps is to not only raise awareness, but above all else, to remind people that they are not alone in their thoughts and struggles, and that hope and help exist. If you want to get started now, we invite you to share the video we created in honor of World Suicide Prevention Day below—post it online or send it to a loved one who might be struggling. Today, this week, and well into the future, we’re asking you to fight with us. 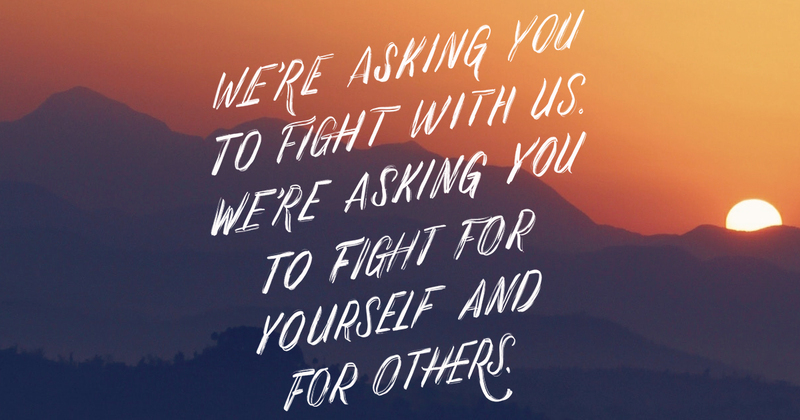 We’re asking you to fight for yourself and for others who need to hear and believe our message this year. Although simple, it bears a truth that you deserve to know: Tomorrow needs you. Love the focus on need for each individual’s contributions to make a better world! Tomorrow needs me to help erase stigma attached to mental health. Wow that has hit me hard. I myself have attempted suicide this blog got me to think about why it’s important to stay alive.